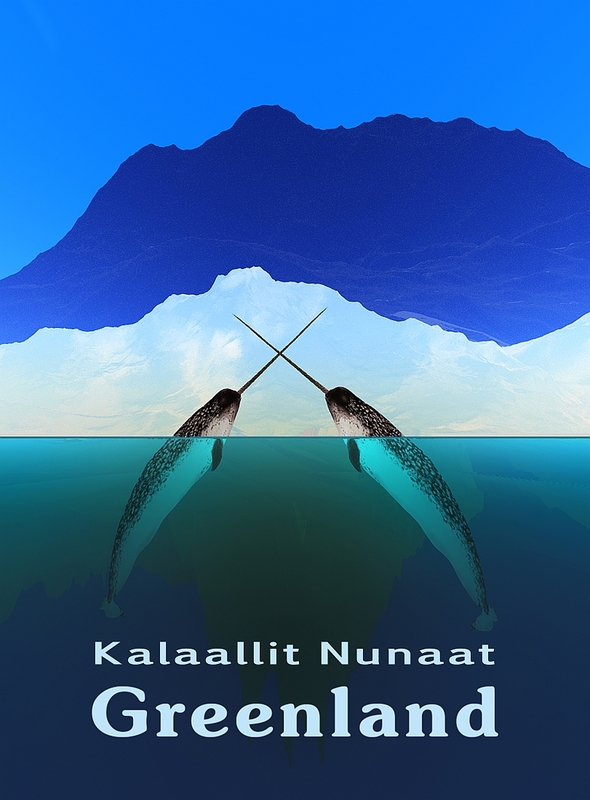 A traditional travel poster-style image of two male narwhal “tusking,” crossing their tusks, with sea ice and the mainland of Greenland in the background. “Kalaallit Nunaat” is what Greenlanders call their island The purpose of tusking, a common activity during warmer parts of the year, is unknown. It may be a friendly greeting or a way to remove lice that typically infest the base of the tusk. Even the ultimate purpose of the spiraled tusk is not known for sure. It may serve the same purpose as deer and moose antlers, the peacock’s tail feathers, or a lion’s mane – to attract a mate. Some researchers believe it may serve as a sensory organ. Perhaps it serves more than one purpose. As usual, this image is available at my Zazzle store. Another in the series of postage stamps for the notional independent nation of Alaska. 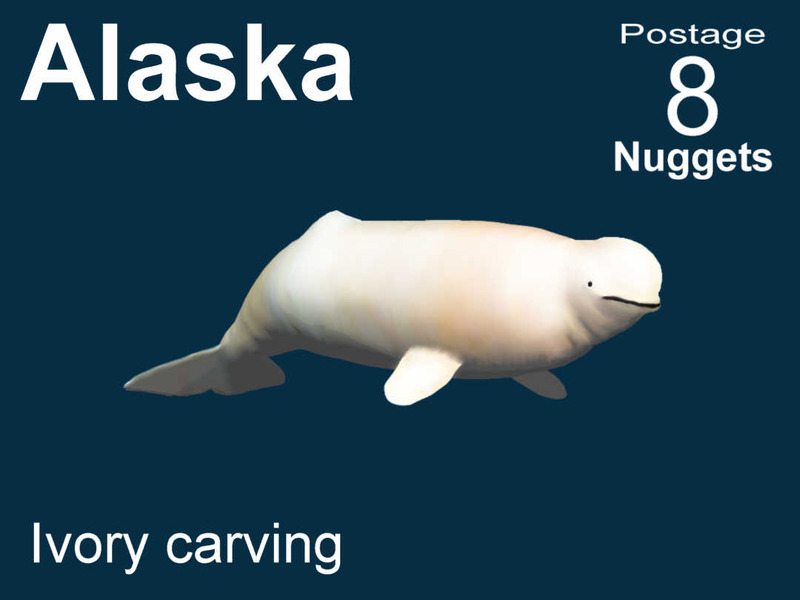 Features a digital rendering of an beluga whale carved from mammoth ivory. Like the carving o soapston, ivory carving is a traditional craft of Alaska Natives. As is true with most of the images that appear here you can find this one on a number of gifts at My Zazzle Store. The beluga or white whale, Delphinapterus leucas, is a small toothed whale found in both the Arctic and sub-Arctic. The English name comes from the Russian белуха (belukha), which derives from the word белый (belyy), meaning “white”. It is sometimes referred to by scientists as the belukha whale to avoid confusion with the beluga sturgeon. The beluga is also colloquially known as the sea canary due of its high-pitched squeaks, squeals, clucks and whistles which can even be heard above the water. A Japanese researcher says he taught a beluga to “talk” by using these sounds to identify three different objects, offering hope that humans may one day be able to communicate effectively with sea mammals. Male belugas are larger than females. Length can range from 8.5 to 22 ft, averaging 13 ft in males and 12 ft in females. Males weigh from 2,400 to 3,500 lbs, while females weigh between 1,500 and 2,600 lbs. The beluga can live more than 50 years. Adult belugas are rarely mistaken for other species, as they are completely white or whitish-gray in color. Calves, however, are usually gray. The beluga’s head is unlike that of any other cetacean. Like most toothed whales it has a melon—an oily, fatty tissue lump found at the center of the forehead. The beluga’s melon is extremely bulbous and even malleable. The beluga is able to change the shape of its head by blowing air around its sinuses. Unlike many dolphins and whales, the vertebrae in the neck are not fused together, giving it a flexible, well-defined neck and allowing the animal to turn its head laterally. The rostrum has about 8 to 10 teeth on each side of the jaw and a total of 34 to 40 teeth. Unlike most whales, it is capable of swimming backwards. The beluga molts seasonally. Belugas have a dorsal ridge, rather than a dorsal fin. The absence of the dorsal fin is reflected in the genus name of the species—apterus the Greek word for “wingless.” The evolutionary preference for a dorsal ridge rather than a fin is believed to be an adaptation to under-ice conditions, or possibly as a way of preserving heat. As in other cetaceans, the thyroid gland is relatively large compared to terrestrial mammals (proportionally three times as large as a horse’s thyroid) and may help to sustain higher metabolism during the summer estuarine occupations. Its body is round, particularly when well-fed, and tapers less smoothly to the head than the tail. The sudden tapering to the base of its neck gives it the appearance of shoulders, unique among cetaceans. The tail fin grows and becomes increasingly and ornately curved as the animal ages. The flippers are broad and short—making them almost square-shaped. The beluga inhabits a discontinuous circumpolar distribution in Arctic and sub-Arctic waters ranging from 50°N to 80°N, particularly along the coasts of Alaska, Canada, Greenland, and Russia. The southernmost extent of their range includes isolated populations in the St. Lawrence River estuary and the Saguenay fjord, around the village of Tadoussac, Quebec, in the Atlantic and the Amur River delta, the Shantar Islands and the waters surrounding Sakhalin Island in the Sea of Okhotsk. In the spring, the beluga moves to its summer grounds: bays, estuaries and other shallow inlets. These summer sites are discontinuous. A mother usually returns to the same site year after year. As its summer homes clog with ice during autumn, the beluga moves away for winter. Most travel in the direction of the advancing icepack and stay close to its edge for the winter months. Others stay under the icepack—surviving by finding ice leads and polynyas (patches of open water in the ice) in which they can surface to breathe. Beluga may also find air pockets trapped under the ice. The beluga’s ability to find the thin slivers of open water within a dense ice pack that may cover more than 96% of the surface mystifies scientists. Its echo-location capabilities are highly adapted to the sub-ice sea’s peculiar acoustics and it has been suggested that belugas can sense open water through echo-location. In 1849, while constructing the first railroad between Rutland and Burlington in Vermont, workers unearthed the bones of a mysterious animal in the town of Charlotte. Buried nearly 10 feet (3.0 m) below the surface in a thick blue clay, these bones were unlike those of any animal previously discovered in Vermont. Experts identified the bones as those of a beluga. Because Charlotte is over 150 miles (240 km) from the nearest ocean, early naturalists were at a loss to explain the bones of a marine mammal buried beneath the fields of rural Vermont. Today, the Charlotte whale aids in the study of the geology and the history of the Champlain Basin,and this fossil is now the official Vermont State Fossil (making Vermont the only state whose official fossil is that of a still extant animal). Belugas are highly sociable. Groups of males may number in the hundreds, while mothers with calves generally mix in slightly smaller groups. When pods aggregate in estuaries, they may number in the thousands. This can represent a significant proportion of the entire population and is when they are most vulnerable to hunting. Pods tend to be unstable, meaning that they tend to move from pod to pod. Radio tracking has shown that belugas can start out in a pod and within a few days be hundreds of miles away from that pod. Mothers and calves form the beluga’s closest social relationship. Calves often return to the same estuary as their mother in the summer, meeting her sometimes even after becoming fully mature. Belugas can be playful—they may spit at humans or other whales. It is not unusual for an aquarium handler to be drenched by one of his charges. Some researchers believe that spitting originated with blowing sand away from crustaceans at the sea bottom. The beluga is a slow swimmer that feeds mainly on fish. It also eats cephalopods (squid and octopus) and crustaceans (crab and shrimp). Foraging on the seabed typically takes place at depths of up to 1,000 feet but they can dive at least twice this depth. A typical feeding dive lasts 3–5 minutes, but belugas submerge for up to 20 minutes at a time. Belugas were among the first whale species in captivity. The first beluga was shown at Barnum’s Museum in New York City in 1861. For most of the twentieth century Canada was the predominant source for Belugas destined for exhibition. Until the early 1960s Belugas were taken from the St. Lawrence River estuary and from 1967 from the Churchill River estuary. This continued until 1992, when the practice was banned. Since Canada ceased to be the supplier of these animals, Russia has become the largest provider. Individuals are caught in the Amur River delta and the far eastern seas of the country and then are either transported domestically to aquaria in Moscow, St. Petersburg, and Sochi, or exported to foreign nations, including Canada itself. Today it remains one of the few whale species kept at aquaria and marine parks across North America, Europe, and Asia. As of 2006 there were 30 belugas in Canada and 28 in the United States, and 42 deaths in captivity had been reported up to that time. It has been reported that a single specimen can fetch up to US$100,000 on the market. Its popularity with visitors reflects its attractive color, and its range of facial expressions. The latter is possible because while most cetacean “smiles” are fixed, the extra movement afforded by the beluga’s unfused cervical vertebrae allows a greater range of apparent expression. Most belugas found in aquaria are caught in the wild, as captive breeding programs have enjoyed little success.For example, despite best efforts as of 2010 only two whales had been successfully bred at the Vancouver Aquarium, one fifteen years prior and another, two. Another three which had been born there had died within three years. As of 2008, the beluga is listed as “near threatened” by the International Union for Conservation of Nature; however the sub-population from the Cook Inlet in Alaska is considered critically endangered and is under the protection of the United States’ Endangered Species Act. Of seven Canadian beluga populations, two are listed as endangered, inhabiting eastern Hudson Bay, and Ungava Bay.Contents The global population of belugas today stands at about 100,000. 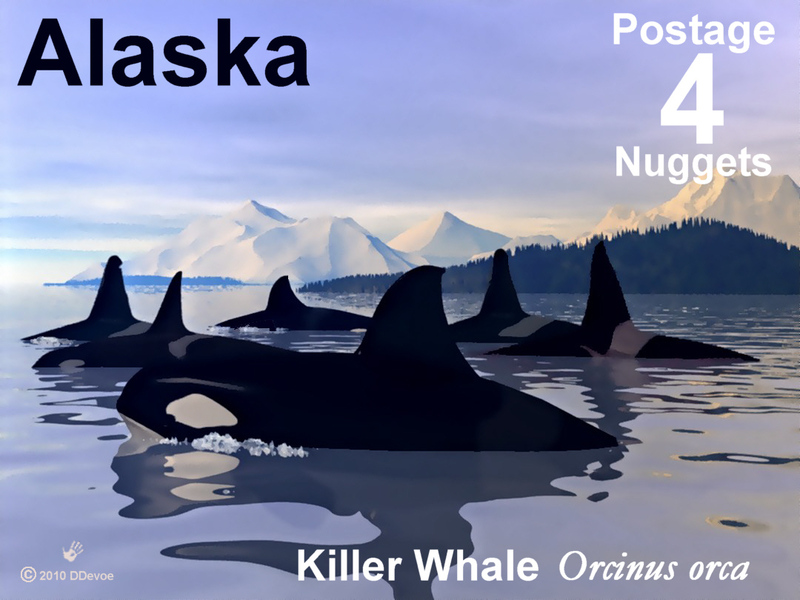 Although this number is much greater than that of many other cetaceans, it is much smaller than pre-hunting populations. There are estimated to be 40,000 individuals in the Beaufort Sea, 25,045 in Hudson Bay, 18,500 in the Bering Sea, and 28,008 in the Canadian Low Arctic. The population in the St. Lawrence estuary is estimated to be around 1,000. It is considered an excellent sentinel species (indicator of environment health and changes). This is because it is long-lived, on top of the food web, bearing large amounts of fat and blubber, relatively well-studied for a cetacean, and still somewhat common. Because the beluga congregates in river estuaries, pollution is proving to be a significant health danger. Incidents of cancer have been reported to be rising as a result of St. Lawrence River pollution. Local beluga carcasses contain so many contaminants that they are treated as toxic waste. Reproductive pathology has been discovered here, possibly caused by organochlorines. Levels between 240 ppm and 800 ppm of PCBs have been found, with males typically having higher levels. The long-term effects of this pollution on the affected populations is not known. Indirect human disturbance may also be a threat. While some populations tolerate small boats, others actively try to avoid ships. Whale-watching has become a booming activity in the St. Lawrence and Churchill River areas. Because of its predictable migration pattern and high concentrations, the beluga has been hunted by indigenous Arctic peoples for centuries. In many areas, hunting continues, and is believed to be sustainable. However, in other areas, such as the Cook Inlet, Ungava Bay, and off western Greenland, previous commercial operations left the populations in great peril. Indigenous whaling continues in these areas, and some populations continue to decline. These areas are the subject of intensive dialogue between Inuit communities and national governments aiming to create a sustainable hunt. To prevent hunting, belugas are protected under the International Moratorium on Commercial Whaling; however, small amounts of beluga whaling are still allowed. Since it is very difficult to know the exact population of belugas because their habitats include inland waters away from the ocean, it is easy for them to come in contact with oil and gas development centers. To prevent whales from coming in contact with industrial waste, the Alaskan and Canadian governments are relocating sites where whales and waste come in contact. To prevent captive whales from dying, researchers from the Vancouver Aquarium Marine Science Centre are finding ways to prevent fungi from entering the habitats and to constantly check their health. Healthy captive belugas are important because they are one of the only whales found in many marine aquariums. The high numbers of captives adds to the threat to the beluga population, while their carcasses contribute to scientific research. Subpopulations are subject to differing levels of threat and warrant individual assessment. The Cook Inlet subpopulation is listed as “Critically Endangered” by the IUCN as of 2006. The Cook Inlet beluga population is listed as Endangered under the Endangered Species Act as of October 2008. This was due to overharvesting of belugas prior to 1998. The population has failed to recover even though the reported harvest has been small. The most recent published estimate as of May 2008 was 302 in 2006. In addition, the National Marine Fisheries Service indicated the 2007 aerial survey’s point estimate was 375. The narwhal is related to the Beluga whale and lives in the Arctic year-round. They are found primarily in the waters of Greenland and Canada rarely south of 65°N latitude. Males weigh up to 1,600 kilograms (3,500 lb), females weigh around 1,000 kilograms (2,200 lb). The largest narwhal ever found weighed 3,500 pounds. They are shaped like a beluga and have about four inches of insulating fat. Narwhals normally congregate in groups of about five to ten individuals. In the summer, several groups come together forming larger aggregations. Narwhal is derived from the Old Norse word nár, meaning “corpse”, referring to the animal’s greyish, mottled pigmentation, like that of a drowned sailor. Narwhal are darkest when young becoming whiter with age. The most conspicuous characteristic of the male narwhal is its single 2–3 meter (7–10 ft) long twisted tusk. It is an incisor tooth that projects from the left side of the upper jaw and forms a left-handed helix. The narwhal’s scientific name, Monodon monoceros, is derived from Greek “one-tooth one-horn.” The tusk can be up to 3 meters (9.8 ft) long—compared with a body length of 4–5 meters (13–16 ft)—and weigh up to 10 kilograms (22 lb). About one in 500 males has two tusks, which occurs when the right incisor, normally small, also grows out. A female narwhal may also produce a tusk, but this occurs rarely, and there is a single recorded case of a female with dual tusks. This behavior is thought to maintain social dominance hierarchies. At times, male narwhals rub their tusks together in an activity called “tusking.” The reason for this behavior is unknown; it may be to “scratch an itch,” (the base of the tusk is usually infested with lice); or tusk crossing may be a friendly greeting. The most broadly accepted theory for the role of the tusk is as a secondary sexual characteristic, similar to the mane of a lion or the tail feathers of a peacock. It may help determine social rank, maintain dominance hierarchies or help young males develop skills necessary for performance in adult sexual roles. Narwhals have rarely been observed using their tusk for fighting or other aggressive behavior or for breaking sea ice in their Arctic habitat. Narwhal usually proceed at a leisurely pace, slowly breathing and rolling, but are remarkably quick when they feel threatened. Sometimes they travel in small family groups and communicate by means of a great variety of squeals, trills, whistles, and clicks. Narwhals have a relatively restricted and specialized diet. Their prey is predominantly composed of Greenland halibut, polar and Arctic cod, shrimp and Gonatus squid. Additional items found in stomachs have included wolffish, capelin, skate eggs and sometimes rocks, accidentally ingested when whales feed near the bottom. How narwhal catch their prey is unknown. Some scientists believe narwhal stun their prey with sound as do dolphins . Narwhal exhibit seasonal migrations with high fidelity of return to preferred ice-free summering grounds, usually in shallow waters. In the winter, they are found primarily in offshore, deeper waters under thick pack ice, surfacing in narrow fissures in the sea ice, or leads. Narwhal from Canada and West Greenland winter regularly in the pack ice of Davis Strait and Baffin Bay along the continental slope with less than 5% open water and high densities of Greenland halibut. Feeding in the winter accounts for a much larger portion of narwhal energy intake than in the summer and, as marine predators, they are unique in their successful exploitation of deep-water arctic ecosystems.Most notable of their adaptations is the ability to perform deep dives. When on their wintering grounds, the narwhals make some of the deepest dives ever recorded for a marine mammal, diving to at least 800 meters (2,400 feet) over 15 times per day with many dives reaching 1,500 meters (4,500 feet). Dives to these depths last around 25 minutes, including the time spent at the bottom and the transit down and back from the surface. In the shallower summering grounds, narwhals dive to depths between 30 and 300 meters (90–900 feet). 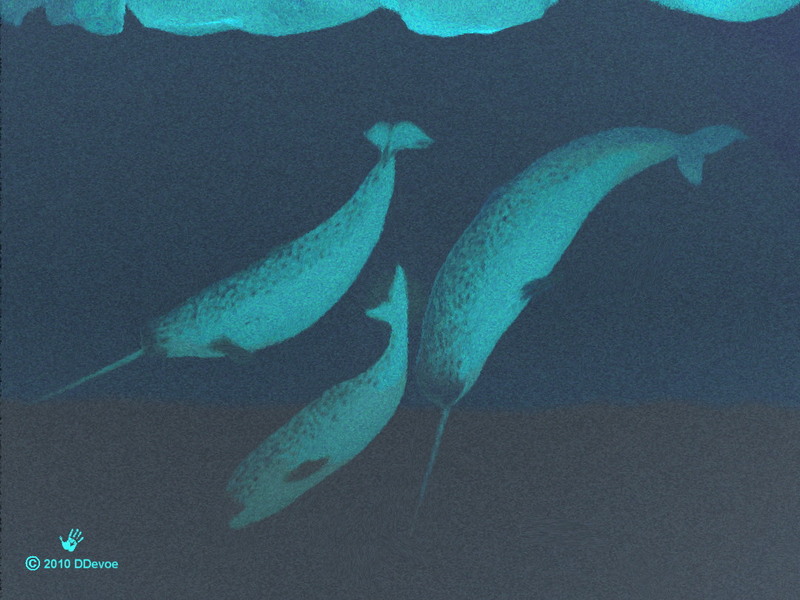 The only predators of narwhals besides humans are polar bears and orcas. Inuit people are allowed to hunt this whale species legally for subsistence. The northern climate provides little nutrition in the form of vitamins which can only be obtained through the consumption of seal, whale, and walrus. Almost all parts of the narwhal, meat, skin, blubber and organs, are consumed. Mattak, the word for raw skin and blubber, is considered a delicacy, and the bones are used for tools and art. 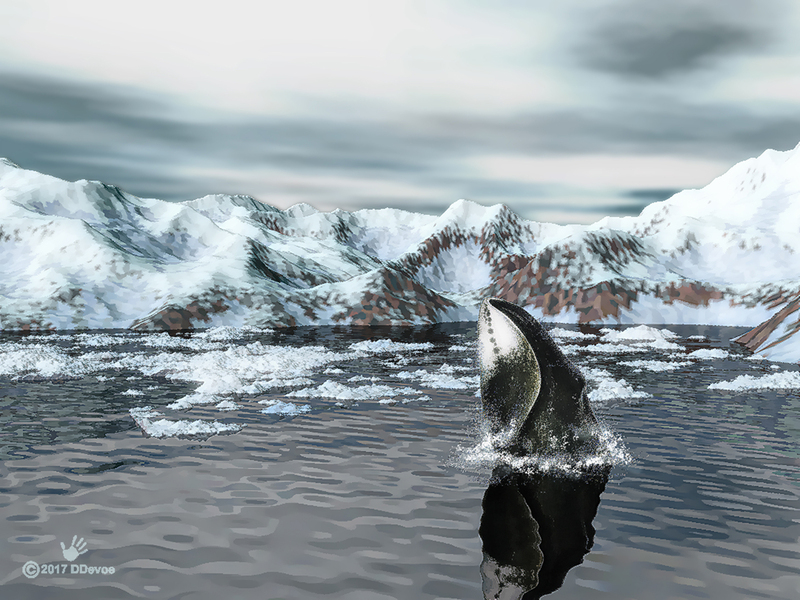 In some places in Greenland such as Qaanaaq, traditional hunting methods are used, and whales are harpooned from handmade kayaks. In other parts of Greenland and northern Canada high-speed boats and hunting rifles are used. While populations appear stable, the narwhal has been deemed particularly vulnerable to climate change due to a narrow geographical range and specialized diet. Narwhals that have been brought into captivity tend to die quickly. In Inuit legend the narwhal’s tusk was created when a woman with a harpoon rope tied around her waist was dragged into the ocean after the harpoon had struck a large narwhal. She was transformed into a narwhal herself, and her hair, that she was wearing in a twisted knot, became the characteristic spiral narwhal tusk. Some medieval Europeans believed narwhal tusks to be the horns from the legendary unicorn. As these horns were considered to have magic powers, such as the ability to cure poison and melancholia, Vikings and other northern traders were able to sell them for many times their weight in gold. The tusks were used to make cups that were thought to negate any poison that may have been slipped into the drink. During the 16th century, Queen Elizabeth received a carved and bejeweled narwhal tusk for £10,000—the cost of a castle (approximately £1.5—2.5 Million in 2007. 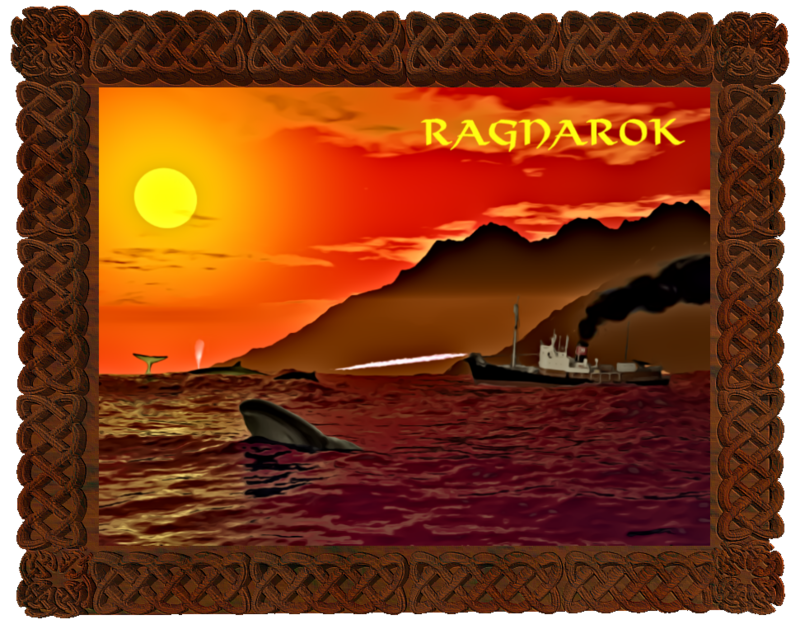 The truth of the tusk’s origin developed gradually during the Age of Exploration, as explorers and naturalists began to visit Arctic regions themselves. In 1555, Olaus Magnus published a drawing of a fish-like creature with a horn on its forehead, correctly identifying it as a “Narwal”.